Review posted September 30, 2018. I love the silliness that comes from the mind of Jon Agee. 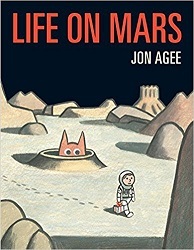 In his latest picture book, a boy has come to Mars to find life. He’s bearing a gift of chocolate cupcakes. He’s sure there’s life on Mars, even though other people don’t think so. But alas! All he finds when he looks around are rocks and dirt. There’s no life on Mars after all! Meanwhile, children will see the large monster-shaped Martian following the kid around. The boy even climbs on “this mountain” (the creature’s belly) to find where he left his spaceship. When the kid gets back in the spaceship headed home, he decides he deserves a treat. But who ate the chocolate cupcakes? This is a child’s first taste of an unreliable narrator, and they’ll love knowing what he doesn’t. It’s an exercise in perspective, too, as you can talk about why the boy doesn’t see the Martian, but we do.